OST Recovery software is a complete solution for Outlook Repair process as, it can perform recovery of OST file from all the causes of corruption and it can perform conversion of OST file in three different formats PST, MSG and EML. This OST File Repair software can Recover OST file with all the details and fields of OST file. Although,if you still face any queries related to activation key, software installation, OST location , OST repair process or any other query then, you can contact our software professions (24x7) to get satisfactory solutions for your queries. 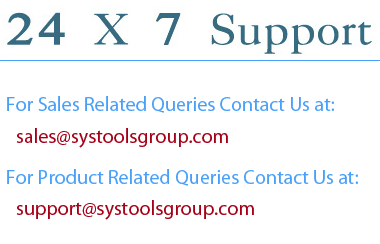 Our software will successfully solve your queries because we feel satisfied when, you are satisfied.